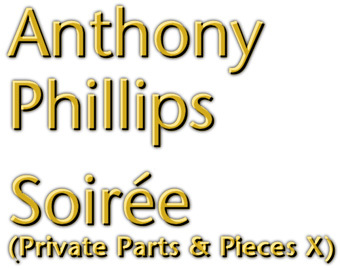 In the evening hours of the second millennium and in the twentieth year of the Private Parts & Pieces series Anthony Phillips releases volume ten. It is simply called Soirée (evening music) and consists of 20 piano miniatures. To be honest, there are no big surprises on it, but it is a special release nevertheless because it is the first album since New England (1992) to include only music that was specifically written for this release. The only exception is a relic from Ant’s time in Genesis. It is a compromise. A well-rounded work like this is more satisfying than a collection of snippets recorded here and there, a live improvisation with Guillermo Cazenave or TV music. On the other hand it permits the artist to continue earning his living (by writing more TV and library music) because it is easier to put together than a band album or an opus such as Slow Dance. The central instrument of this album has been heard on many of Ant’s releases, but Soirée is the second “pure piano” record after Ivory Moon (1986). To be more precise, it is a Challon grand piano which was used for all recordings made in Send Barns or Englewood Road (“Vic’s place”). The instrument was also used before for the Tarka demos, some of which can be heard on Gypsy Suite. Ant was assisted by piano tuner John Armour (who must have gotten rich during the recordings). Chris Thorpe, Trevor “Il Professore” Vallis and Rog Patterson took care of the mixing. It has to be pointed out, though, that all the pieces were recorded without any overdubs (i.e. addition of other recorded material). The bulk of the record was written in the early 1998. Only Creation had been around for some thirty years (November 1968). The songs were recorded between May and July and again between November and December of the same year before they were prepared for print in June 1999. The pieces were not sorted in any way, it is just one of some 2.4 billion billion possible combinations. It was only made sure that any two consecutive pieces were not too similar. In an interview with Alan Hewitt Ant admitted that finding titles for the miniatures was the most difficult thing apart from recording three or four of the pieces. 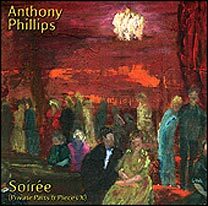 In the end, he resorted to a dictionary of musical terms… The album title refers to the soirées, during which well-to-do people in impressionist France used to experience pieces of chamber music written by established composers. Brenda Brooks’ cover painting of a such a drawing-room also draws on this theme. It is nicely contrasted by a current photo of the artist on the back of the booklet. Sad Ballerina opens the evening’s performance with tender melancholy. It is one of the most convincing pieces of the Soirée. A simple unique melody in octaves (like in Let Us Now Make Love) is varied, Phillips-style, in different tones. The modulations are unexpected and, as far as merry hearts are concerned, even quite unwished for. Final Lights brings out a less inspired melody in arpeggios. The title may be due to the fact that the notes that make up the melody are the final notes of an arpeggio. Then there is a meditation called Sultry Leaves. Notes like chiming bells fill the three-four rhythm. After a while a little bell comments on the dreary pulse of quarter notes in eighths and sixteenth. The ensuing intermezzo Fivers takes its name from the characteristic 5/8 beat that occasionally switches into 6/8. The piece reminds Ant of Johann Sebastian Bach (the 250th anniversary of whose death takes place in 2000). He also had a hard time recording it but one would never know it from the way it sounds. Creation never found its way into the Genesis repertoire. It was originally played on a piano prepared with some needles which then sounded like a cembalo, but it was not possible to recreate this sound at Vic’s Place. An attempt to obtain the cembalo sound by using overdubs worked but the sound had grown so rich along the way that it threatened to overshadow the other tracks. In the end, they did not use them. This interesting number from the fertile late 60’s took more time to rehearse than many others. Keepsake is little more than a filler. In fact it almost qualifies as kitsch. Venetian Mystery is all the more moving after Keepsake. Though a certain feeling of déjà ecouté presents itself here (and elsewhere in the Soirée), it is quite difficult not to succumb to the charm of this gem. Scythia works along the same principles as Final Lights. The song seems like a toccata, as if it were following a certain algorithm. There are far more ideas in this song, though. At this point, the reviewer would like to mention reminiscences of the humourous and experimental suite Sea-Dogs Motoring On Ivory Moon. A Cantilene is a piece of music with a melody people could sing to. This one is an ostinato (a riff, as it were) based on changing harmonies. A middle section interrupts the ostinato for a pleasant tune. The Oregon Trail leads us to the trails of the Wild West treks. The main theme is a ponderous full of nostalgia and adventure. A secondary theme evokes the happier sides of that age. In a passacaglia an underlying ostinato theme of eight bars’ length in 3/4 is varied in a colourful and virtuoso manner. Phillips’ Passacaglia, however, is only moderately varied and does not showcase a lot of virtuosity. Neither is the main theme located in the bass group, where it invariably was in the works of Bach and Händel. The melody is quite catchy, though, so that one quickly begins to like this piece. For a while Ant had planned to call the piece a “hymn to [somebody or something]”, but in the end he refrained from doing so. Gazebo is a brief and light-footed fantasie with many chiming overtones produced by pushing the right pedal. One of the virtuoso piece of the Soirée is Passepied. It is the name of an old French dance in a fast 3/4. It is also the title of one of Claude Debussy’s pieces for piano, despite it’s four-four measure. Since Debussy could, Ant was sure he certainly could use the title for his piece. It was shortly after Diana, Princess of Wales, had passed on that Ant wrote Fallen Flower and dedicated it to her. For a long time he was in two minds as to whether the piece should be included on the album. There may therefore be an emotional value to Fallen Flower for Ant. Musically, it is among the most negligible on this disc. The mood lifts again when Noblesse Oblige begins. Perhaps Diana would have preferred this piece… or the next one. Hope Of Ages seems like a variation of Noblesse Oblige. The melody is, as often in Ant’s work, brightly enhanced by putting it up an octave. Once again we hear Gazebo. Only this time we get to hear it backwards. In the past twenty-five years Ant could not resist this joke which leads on to the Rain Suite. If you expected a piece in several movements prepare to be disappointed. Moderately fast movements of sixteenth notes are supposed to represent rain. The title is justified by the fact that the Rain Suite consists of distinct passages which can be heard as different types or phases of rainy weather. It is no doubt one of the most “experimental” pieces of the evening music. After You Left is a song without words, as it were. No words are needed, for the listener will understand what this piece is about…. In an effort to end the album on an upbeat Ant saved Summer’s Journey for the end. It is a pastoral journey which brings out the wonderful sound of the old Challon. Unimpressive alternating quarts do not make you regret leaving the drawing-room. All in all, it is a pleasant album without big surprises. It certainly was a needed album, because nothing had been heard of Ant’s piano-playing qualities since 1992. Soirée proves he still has his own style, blunted a bit because his head is full of themes for wildlife documentaries and TV jingles and orchestal library music. The unnamed star of the recording is the grand piano and its grandiose sound. Because of it, Ant’s Soirée gives you an appetite for [repeat].